Tenants rallied in front of 755 Jackson Avenue to draw attention to the building’s horrific conditions. Residents of a dilapidated apartment building in Melrose say their landlord, the private equity firm Stabilis Capital Management, is ignoring their pleas to fix it as it falls into deeper and deeper disrepair. On Dec. 3, elected officials joined a dozen tenants and advocates in front of 755 Jackson Ave.near East 156th Street to demand that Stabilis sell the 11-apartment building to a responsible landlord or face consequences in court. Stabilis specializes in acquiring run-down properties, and housing advocates say it milks buildings for profit without regard to their tenants. Recently, a judge took control of a building in Hunts Point away from the firm, appointing an administrator to manage it. In a show of solidarity, tenants of that building joined the Jackson Avenue tenants. Several residents from 836 Faile Street in Hunts Point, another Stabilis building, came to support the Jackson Avenue tenants. A housing court judge put an administrator in charge of the 36-unit Faile Streete building earlier this year. But life in the building has not improved under the administrator, she said. The administrator has not been cashing rent checks or returning calls for repairs. “At first he seemed interested, but after two weeks he started ignoring calls,” said Paulino, who thinks the administrator didn’t anticipate the depth of the problem when the judge appointed him. 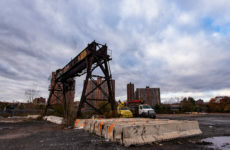 The Faile Street tenants have filed a motion in State Supreme Court on the Grand Concourse demanding that Stabilis provide funds to complete repairs. “The whole year’s been pure torture,” said Angelica Rosado, a tenant in her 20s who moved to the third floor of the Jackson Avenue building with her husband and disabled daughter a year ago. 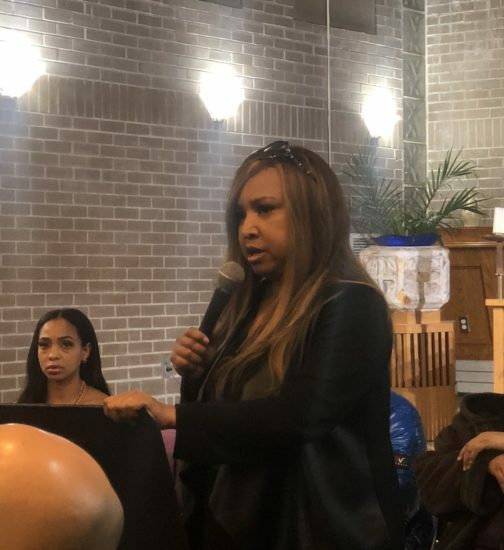 She showed her apartment to Public Advocate-elect Letitia James and a representative from City Councilwoman Maria del Carmen Arroyo’s office, who had come in response to tenants’ complaints. Rosado’s apartment is infested with rats and roaches, she told them. In addition, the fire escape is rusted and unsteady and her father was injured falling through a hole in the stairwell while visiting, she said. Strangers and homeless people often enter the building, even though the management company, Dafnonas Estates Ltd., replaced the front door in May when Rosado filed a claim in housing court. Rosado says the company threatened to have her evicted whenever she called to request repairs. Tenants say that since Stabilis bought the mortgage in June, a manager at Dafnonas has told tenants calling for repairs that his company is no longer responsible. But according to Kerri White, an organizer for the advocacy group Urban Homesteaders Assistance Board, which is working with the residents, Stabilis officials maintain that Dafnonas is still managing the building. The city Department of Housing Preservation and Development has found more than 200 violations in the building, which is on both that agency’s and the Public Advocate’s list of the city’s 200 worst buildings. Stabilis did not immediately return calls from the Herald. Tomika Anderson, 28, has lived in the building for two years with her husband and three children. She showed visitors a 4×4 hole in her ceiling covered up with plastic and tape. Her children were doing their homework and watching TV beneath it. Anderson said she and her husband have paid for repairs on the ceiling and floors on their own because the landlord and management company ignored them. “The amount we paid, we could buy a house,” she said. Trash piled up in front of the building. Two workers whisked it away before the rally began. Two workers were painting the entrance and hallways shortly before the elected officials arrived. Two other men hastily emptied three bins overflowing with trash bags in front of the building. Anderson sneered at what she said was Stabilis’ cynical attempt to fool visitors. “These people think they slick,” she said. “They can’t hide what they’re doing with a superficial paint job,” James assured her. Barakett founded the hedge fund Atticus Capital in 1995, and served as that firm’s chairman and CEO until it crashed in 2009. Before its demise, Atticus had become one of the world’s largest hedge funds, with over $20 billion in assets. The director of a prominent Longwood-based housing advocacy group that has helped the tenants voice their grievances is hopeful a judge will strip Stabilis of the Jackson Avenue building and assign it to a conscientious management company during a transition period, then have it sold. “If things work out, it will get into responsible ownership,” said Harry DeRienzo of Banana Kelly Community Improvement Association. Private equity firms buy the bad debt on buildings to turn a profit for investors, with no concern for living conditions, he explained. “These people aren’t even in the equation,” DiRienzo said of the tenants. 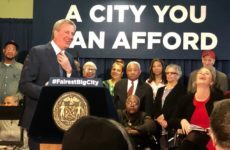 Stabilis has earned a reputation in poor neighborhoods in other cities as well, said White. At the rally, she read a letter sent by a tenant in a Chicago building owned by the firm, who wrote that after Stabilis bought the mortgage it removed the hot water pipes, then offered tenants $100 each to move out. Stabilis later evicted the tenants illegally, she added. “People are seeing the pattern,” White said.